#FCOW aka Food Check Out Week? What's that? - JP loves LIFE! #FCOW aka Food Check Out Week? What’s that? Some of you may have missed the tweets and Facebook posts over the last several days, but I noticed lots of friends mentioning Food Check Out Week or tagging things with #FCOW. I wasn’t really sure what it was so I was interested when my friend Cyndie posted the proclamation by Secretary of Agriculture Tom Vilsack. Now I know a good bit more and to think, Food Check Out Week starts now! Wow. Sounds like a reason to thank quite a few farmers and ranchers! With all of that in mind, it’s clear why he would want to proclaim a time for us to stop and thank those men and men who are helping provide our food. And it’s certainly something we should all think about as we head to the check-out counter with our baskets! I encourage you to make sure you take advantage of the safe, nutritious options we have! I think I’ll also push to remember it if I eat out or something too 🙂 ! But what I really love is how farmers are celebrating by giving back to their communities! You may have seen the post about Ray & Jeff’s commitment to help feed people in their communities. As someone who’s family has the luxury of eating foods way to they like, not simply whatever we can afford, it occurs to me that I need to determine a way to observe Food Check Out Week myself. I’ll make some calls and see what may make sense. In your community, give time or food to a local food bank, help at the Ronald McDonald House in your area or find another way to give back. Definitely join the Food Check Out Week Facebook fan group the Farm Bureau will donate $1 to Ronald McDonald House in Galveston, TX for every fan! Also on Facebook, join the discussion farmers & consumers are having in Farm2U and become a fan of farmers. On Twitter, use the #FCOW or #thankafarmer tags. If you don’t know some farmers on twitter, why don’t you pick a few who farm in your state or grow a favorite crop from the FollowFarmer database? or maybe participate in an Agchat or FoodChat session (learn more here). On the web, check out some of the farmer website/blogs I frequent (quite a few offer Facebook, Twitter & YouTube connections too! If you’re a farmer & I missed yours, please help me get it on the list!) Some of the farmers who post most frequently are: Doug Martin of Martin Farms website & blog, David Brand of Brand Dairy Farm, Debbie Borg, Troy Hadrick, Tom Tibbits and more! Thanks, Janice. 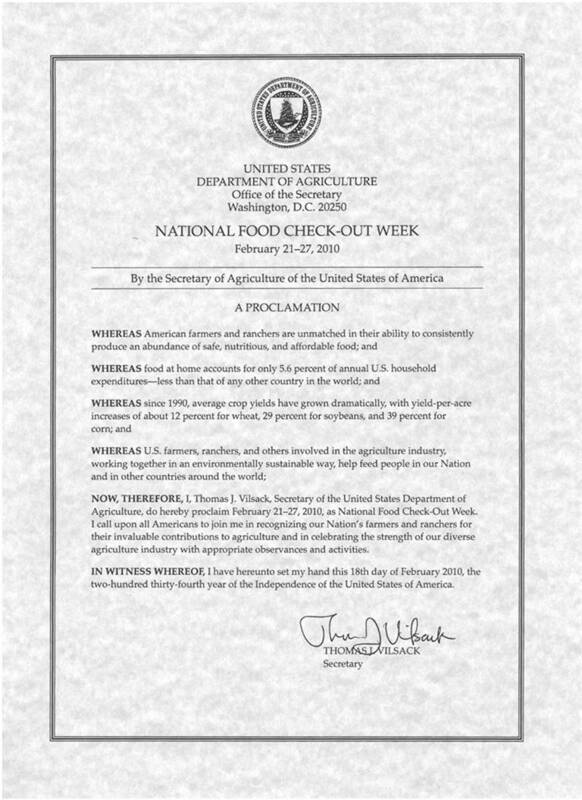 Great explanation of Food Check-Out Week and why we should all be grateful for our plentiful, secure food supply!